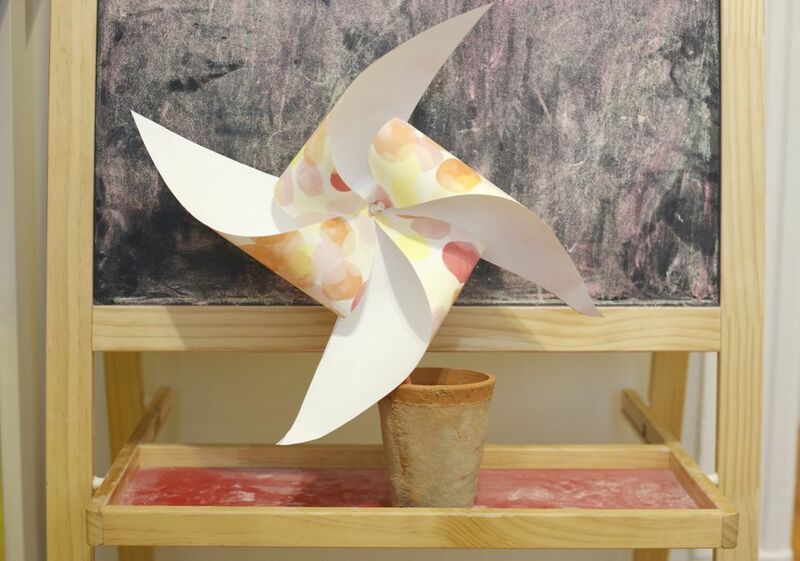 Making paper pinwheels is an extremely versatile craft! It is easy enough that children can make it with little supervision and lovely enough to add some whimsy to any event you are planning to DIY some decor for. This original fidget spinner can be made with recycled paper, or pre-selected craft paper if you are working with a particular color palette for an event. If you do not have children, making these pinwheels is an excellent DIY project for decorating baby showers, adding a fun touch to a brunch buffet, and could even be a lovely addition to a wedding. Using a ruler, mark the center of your square paper with a pencil. If you do not have a ruler, you can eyeball the center pretty easily. Next use your ruler to draw a diagonal line from each corner of the paper, halfway to the center dot you just made. Note: If you are using printed paper, where one side is white and the other has a pattern, make sure you draw the lines on the white side of the paper. Use the scissors to cut down the diagonal lines you just marked on your paper. Fold alternating points (every other point) into the center dot and put a pushpin through. This step can be tricky since the points like to escape if you are not holding them tight–so patience is key. Hold the pushpin with gathered points in one hand tightly and use your other hand to push the remainder of the pin through a straw. We used paper craft straws for these pinwheels but you could also attach your pinwheel to a plastic straw or a pencil. Once your pushpin is through the straw, use a little bit of masking tape to make sure no little fingers get stuck by the pin.